Kitchen cabinets must fulfill two requirements, be stylish and functional. Cabinets can be manufactured using a variety of different materials and can also be designed using unique styles. For instance, MDF kitchen cabinet doors can work well in not only your kitchen but your bathroom as well. While function is crucial, form is equally as important. Wood is an excellent material to use to achieve the perfect style of warmth and natural beauty in your kitchen space. Regardless of your choice, cabinets are a huge part of the entire aesthetic of your kitchen. At The Door Maker, we are the leaders in creating and manufacturing MDF kitchen cabinet doors and other products in the industry! Neutral Coloured Cabinetry: While white MDF kitchen cabinet doors are a classic in the kitchen, grays and other neutrals are becoming increasingly popular. If your budget allows it, you should consider replacing your existing cabinetry with a few of the great options we offer at The Door Maker. However, if it is not in your budget to replace your cabinetry, consider refacing instead. 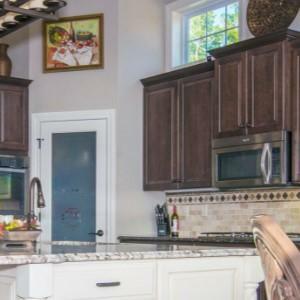 Trying a new coat of paint on your cabinet can help liven things up in your kitchen for the time being, but a complete remodel gives you the opportunity to try a completely new theme. Specialized and Functional Cabinets: Maximizing your existing space in your home is important. You should choose the most optimal storage solution that offers the best functionality for your home. Cabinets today include drawers with multiple compartments, pull-out shelves, spice racks, and customized cabinetry for pots and pans. These cabinets are made to use every inch of the available space for efficient and convenient space to work with. Sleek and Simple Style Cabinetry: The simple and elegant modern cabinet doors are trending amongst homeowners. Ornately designed cabinet doors are less in style when compared to clean lines of MDF cabinet doors. Sleek and long cabinet handles help accessorize cabinetry while adding functionality. At The Door Maker, we pride ourselves on delivering high-quality products to our valued clients. Our cabinet doors are cost-effective and custom to fit your unique requirements. Call or email us today to learn more about the products and services we have to offer.